2010 September 14 » Embroidery Talk Has Moved! I wrote the first part of this series on September 2. At the end of that post, I promised the next part of the series would cover machine type, material type and also offer a few tips. There has been a longer delay than I had planned in writing the second part of this post, but I figured I’d make good on my promise today. Let’s start with machine type. I’ve spoken with people who swear up and down that their particular machine only runs properly when a certain type of thread is used. Leaving aside the personification of an inanimate machine, I’m willing to bet that the machine runs best with a particular type of thread because the operator has discovered the settings that are optimum for that brand of thread. Running a new thread on your machine will require some test runs and some adjustments of tensions and other settings. Be prepared to endure a bit of trial and error before the thread starts running smoothly. When it comes to material type, it is probably more the effect that you want than the type of material which will dictate which thread you choose. Glittery embroidery will require metallic thread. Special effect embroidery will require special effect thread. The weight of the material may have some bearing on the weight of the thread you choose to use, since a very heavyweight thread could damage delicate materials, or at that very least pull the embroidery out of shape. Your choice of stabilizer can also have a impact on how the thread sews into the material you’re using, so make sure you choose a stabilizer that is suited to your chosen material and to the density of your design. Another thing to consider when choosing thread, particularly if you are considering switching from one brand of thread to another is color matching. 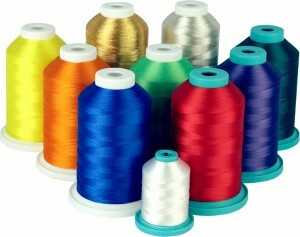 Luckily most thread manufacturers and distributors have made the process of switching relatively easy. Some, like EnMart, offer online conversion engines. Others offer a library of conversion charts. There are also software options like MyThreadBox. Please keep in mind that the matches available from all these options may well be the closest possible and not exact. In most cases, however, the match should be close enough to be suitable. Finally, once you’ve chosen the embroidery thread you wish to use, you need to remember a few simple things to ensure that your thread will run properly. One very important item is machine maintenance. A machine that is clean and lint free and properly oiled will be more likely to run thread smoothly and without breaks. Another thing to remember is the importance of good digitizing. A properly digitized design is a design that will run smoothly and sew into the fabric as it should. I’m sure there are many more tips and hints out there about choosing the right machine embroidery thread, but this post has to end at some point. If you have a tip or hint to share, please leave it in the comments.